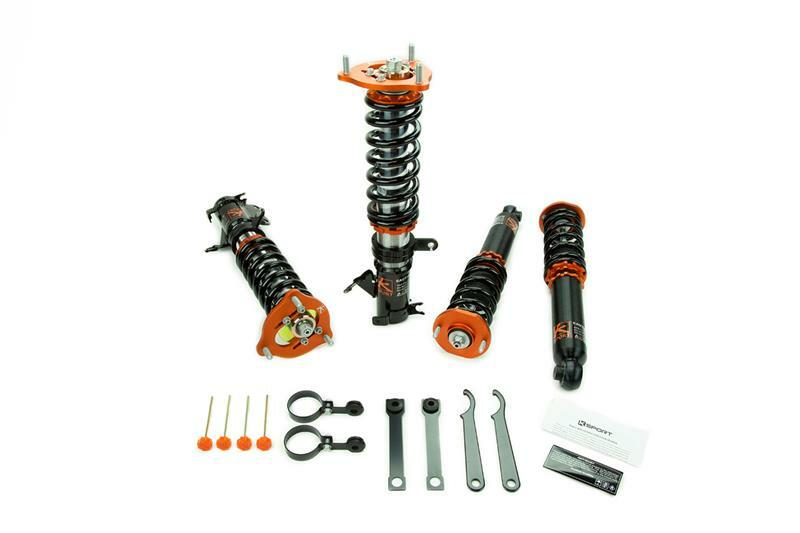 Ksport GT Pro coilover System provides the ultimate in suspension technology featuring an inverted monotube design, 36 levels of adjustable damping, adjustable spring perch, adjustable body and pillow-ball mounts. With the gas/oil chamber farther away from the knuckle and braking system reducing heat transfer. This design also reduces under-sprung weight, which improves handling and responsiveness. 36 levels of damping adjustment allow you to fine tune the ride to your handling and comfort needs. The damping adjusts compression and rebound simultaneously for ease of adjustment. Pillow ball top mounts in the front and rear on some applications allow you to maintain vehicle manufacturer suspension geometry design. The pillow ball top mounts also allow you a more direct feel for solid driver response. Camber adjustability is included on pillow ball top mounts that allow it for the ability to adjust camber from the actual coilover, instead of a separate camber kit. The Ksport system uses a Monotube design in which the oil and gas are separated within the cylinder. When compared to twin tube designs the Monotube dissipates heat better, allows finer damping adjustments, and requires more expensive design process. Aeration and cavitation are a lot less common in a Monotube design, which results in a better ride. Most applications utilize an adjustable lower mount, which means you adjust height without losing suspension travel like some other coilover designs do. With the mounts and most pieces of the coilover being designed for 6061 billet aluminum the kit is lightweight, durable, and rust resistant. The steel shock body is electroplated with zinc to resist rust and the elements. The valving of each set is matched to the springs installed for unmatched ride quality and reliability.